WE Bike NYC is organizing ten women from five organizations to ride 262 miles on bicycles from New York City to Washington, DC to represent their communities at the nation’s largest annual bicycle advocacy event, the National Bike Summit on March 3, 2014. WE are so pleased to be supported by WomanTours, Bicycle Times Magazine and Transportation Alternatives. For more about the ride, check out our fundraising page HERE! Now that you have gotten to know who WE are, learn more about us and our process. WE will be rolling out a series of guest posts from our riders and sponsors. 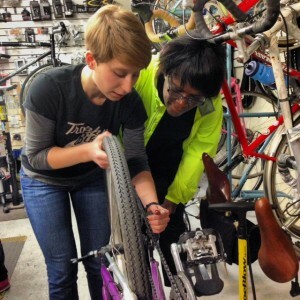 When organizing this ride, WE knew Katie would be an excellent teammate as the founder of Women Bike PHL (as part of the Bicycle Coalition of Greater Philadelphia). Click here for more information on the work of this stellar organization.